With the increasing competition in the education field, the school’s digitization is a must for effective & efficient management. Student Admission is the most important and hectic part of the school. Every year getting thousands of admission form in the school, selecting good students among them, confirming their admission, sending alerts to parents, all this process is done manually by the school. But now most of the schools have adopted the software that make their work very easy and efficient. So, here is where a school admission management system plays a role, where all the problems regarding the admission can be solved in a very easy and efficient way. How school admission management system will help? Digitize the school admission process with smart school admission management system and students can find the school very easily if having a website. Error-free data in the software and no fear of missing any mandatory field, if in case student misses any field to fill the school admission management system will prompt to fill the fields. Parents and students need not to stand in a long queue for filling the form, they can directly fill the form online anytime, anywhere & can also be integrated with the school’s website. No need of multiple people for multiple task. One person can do multiple task that are filling student details and verifying student details & manual work reduces to a lot of extent. As now a days people have a very hectic schedule, visiting the campus & filling the form is more time consuming so with anytime, anywhere access in school admission management system it is very easy to fill the admission form online and lot of time can be saved. With school admission management system, the use of paper can be reduced to a lot of extent & will help your campus go completely paperless. Vidyalaya school admission management system is so easy to use for users & access the software smoothly. Admission Inquiry: The very first procedure in school is admission inquiry, With Vidyalaya one can keep the log of the students who have come for the inquiry. Later on can also take the follow up of the students those are interested for the admission. Admission Form: Vidyalaya school admission management system provides a detailed admission form in which the basic details of the students can be filled and also an online admission form that can be integrated with organizations website. So that the student can fill the form anytime, anywhere. Sorting of Students: With Vidyalaya school admission management system one can sort the students so easily and can save a lot of time. Students can be sorted based on their previous marks, another way to sort the students is conducting the entrance exams or interview and, on the marks, obtained by the students you can create the merit list also directly. 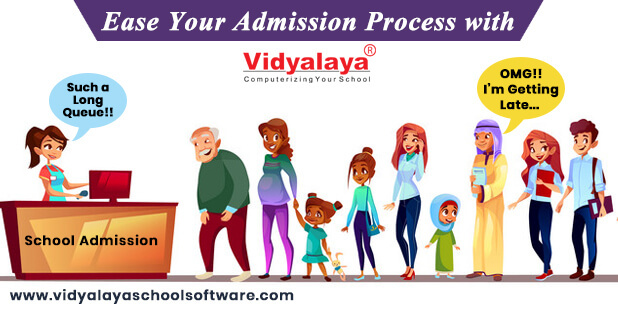 Confirming Students: Vidyalaya school admission management system helps in generating a merit list of the students who gets the admission in the school. Based on the merit list school can send the confirmation mail, SMS, notification to the parents or students. How Vidyalaya school admission management system differs? Can personalize the Admission Form according to class wise, and according to the need of the organization. Can manage Student as well as Employee Admission process very easily and can manage all the data such as Basic details, Contact Details, Demographic details, Health Detail, store Documents and much more. Student Gr can be generated very easily and Employee Username can also be generated in an efficient and easy way. Fees can be paid at the time of Student Admission. Students previous school data and Employees previous organization data can also be managed. SMS, E-mail, Push Notifications can be sent in Mobile App regarding the student confirmation in school, their daily attendance, student’s behaviour can be marked by the teacher and much more. As the technology is increasing very speedily and the schools also need to be updated so, with Vidyalaya school admission management system you can very easily, in an efficient way manage all your admission in a hassle- free way.